Practice Areas: Insurance and Reinsurance Disputes. In the past twenty years Tammy has specialized in Insurance and Reinsurance disputes. Her work involves litigation in various fields: Class Actions in insurance matters and consumer claims, Property, Agriculture, Chemical products, Pharmaceutical companies, Banking, Professional Indemnity medical Malpractice, and others. 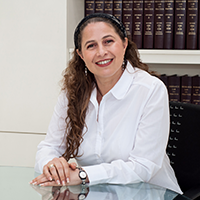 Tammy has served as a Disciplinary Court Judge of the Israel Bar Association. Education: A graduate of the Bar Ilan University. Tammy has seven years experience as a lecturer on Insurance Law in academic institutions and other forums including the Advanced Education Institute for Judges. Membership: Tammy heads the Reinsurance as well as the Agricultural insurance departments and Med-Mal insurance department.